In June of 2017, The PUR Clinic will be hosting the launch of the Drive For Men’s Health. There will be food, beverages, as well as a one of a kind car show, making this the perfect morning for you and your group! Moreover, several speakers will be present to entertain you, as well as inform you on various issues facing men’s health in today’s world. 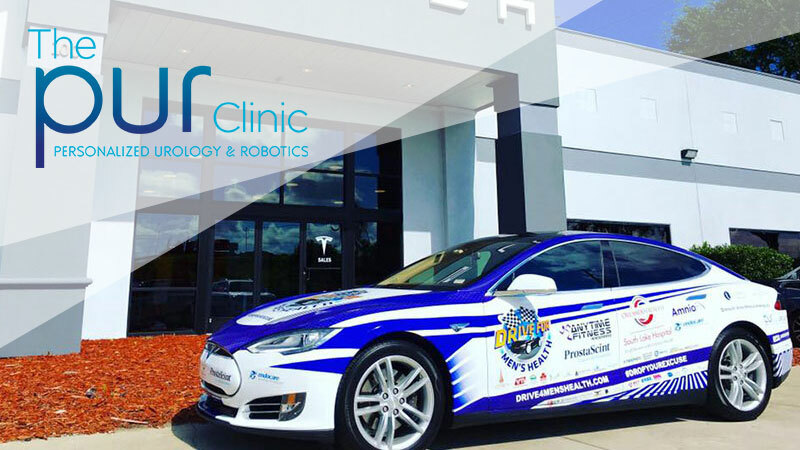 The drive itself will cover over 2,500 miles, as Dr. Sijo Parekattil and Dr. Jamin Brahmbhatt travel across the nation, from Florida to California. These two physicians will be making their journey through the United States in an all-electric Tesla vehicle. The purpose of this drive is to raise awareness on pertinent health issues affecting men. For instance, it is not widely known that prostate cancer is the second most common type of cancer affecting men throughout the globe. One man in every thirty-eight men diagnosed with this illness dies. These men perish, despite the fact that prostate cancer is 100% curable if doctors diagnose it early enough. The two drivers, Dr. Parekattil and Dr. Brahmbhatt, will deal with this issue, among many others during the drive. Their objective is to raise the level of awareness among men when it comes to preventable health problems. The two drivers are also seeking to educate male adults on positive lifestyle choices. Lastly, Dr. Parekattil and Dr. Brahmbhatt will both speak to men about opting for early treatment for certain medical conditions. Dr. Parekattil and Dr. Brahmbhatt both work as surgeons at the PUR Clinic, one of the principal sponsors of this drive, providing them with extensive knowledge on men’s health issues. This includes infertility, testicular pain, and urologic diseases. The two physicians are also leading the way on post-vasectomy pain, male infertility, and post inguinal hernia pain. Because of this, you can trust them when they speak to you about any issue related to men’s health during their drive. The PUR Clinic itself specializes in providing personalized urology and robotic services to its patients. These services include vasectomy reversals, groin & testicular pain, etc. among many others. The PUR Clinic saw it necessary to sponsor the Drive for Men’s Health, because of its strong commitment to helping men overcome their many health issues. In conclusion, you should seriously consider taking a visit to the launch of the Drive For Men’s health. In fact, invite your family and friends as well. You can all enjoy some food and drinks, as well as learn something important about your health.